Cornbread stuffing with apples has a touch of sweetness from apples and sweet cornbread. The apples,celery, and onions also give it a little crunch. It’s the perfect side dish for any holiday meal. 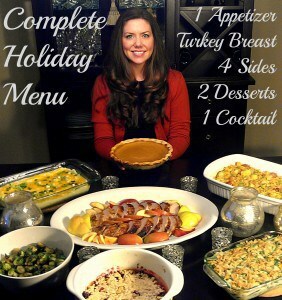 This recipe is part of The Wholesome Dish Complete Holiday Menu. Check out the full menu HERE. 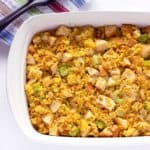 Cornbread stuffing with apples is slightly sweet and delicious. The apples pair nicely with the sweetness of the cornbread. Celery and onions give it a slight crunch. This is a great side dish for a holiday meal or a party because it feeds a crowd. I started by making my own cornbread, but store-bought cornbread would be just fine. I used 2 Jiffy corn muffin mixes that I prepared in a 7×11″ baking dish. The cornbread gets cut into cubes and spread out onto a baking sheet. Then it gets baked again to dry it out, making it ideal for stuffing. The dried cornbread gets combined with apples, sautéed celery and onions, and chicken broth. Then it all gets spread into a large baking dish and baked until the top is golden. Cornbread stuffing with apples has a touch of sweetness from apples and sweet cornbread. The apples,celery, and onions also give it a little crunch. It's the perfect side dish for any holiday meal. Spread cornbread onto two rimmed baking sheets and bake until dry and golden, about 15 minutes. In the meantime, heat the oil and butter in a 3 quart sauce pot over medium heat. Add the onion, celery, salt, and pepper and sauté until slightly tender and translucent (about 5 minutes). Stir in 2 ¼ cups of the broth and the apples. Remove the pot from the heat and add in the cornbread. Mix to moisten the cornbread. If the mixture seems a little dry, add more broth at this stage. Spoon the mixture into a large baking dish that has been sprayed with cooking spray. Bake until top is golden, about 20-25 minutes.